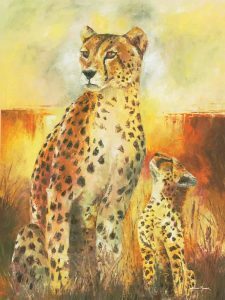 Cheetah paintings and art work are popular among art collectors. These cats represent speed as the fastest animal on earth. 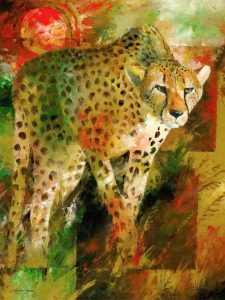 Both paintings are 24″ x 30″ in size and available in different size prints. 1. Cheetahs will make specific face expressions to signal their mood. 2. These cats can grow up to 5 feet in length. 3. They can reach speeds of 71 mph in just 3 seconds. 4. Females can give birth to two to eight cups. 5. Cups will stay with their mother until they are 2 years old.